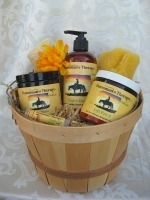 We're making it easy to give with our Horseman's Therapy Naturals Gift Basket. All those great Horseman's products you know & love packed in a farm basket, wrapped with clear wrap, & tied with organza ribbon: Hands Down Lotion 8oz, Smooth Me Salt Scrub 8oz, Let's Face It Face Cream 8oz, Lips Fixed Lip Balm, a natural Loofah, natural Sea Sponge, & a pair of Exfoliating Gloves. Ellisa says "soooooo cute!!" Avocado Dreamin - Creating A Higher Standard. © 2011 Avocado Dreamin' LLC All rights reserved.